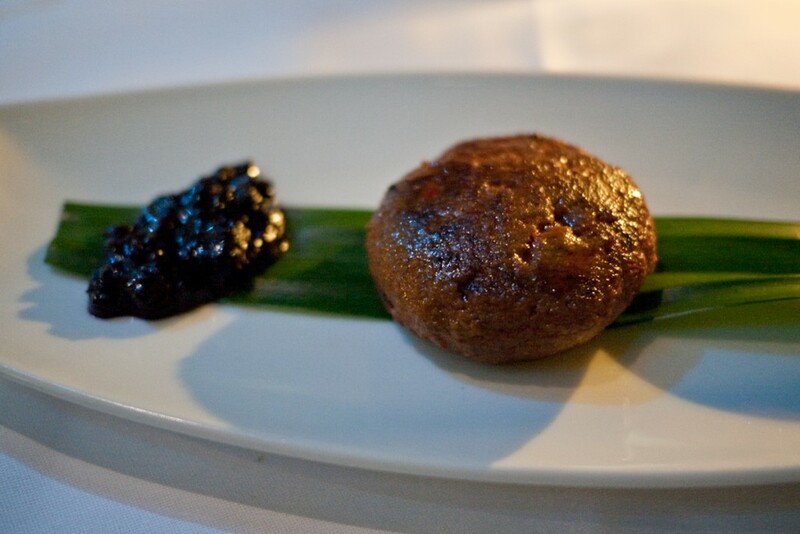 Goose galouti, a moist piece of minced goose meat kebab, had been spiced with cloves, caramelised onions, cinnamon and sufficient chilli to give it lots of firepower. The combination of spices proved to be quite exotic, and the accompanying blueberry chutney worked well with the spicy, hot meat. 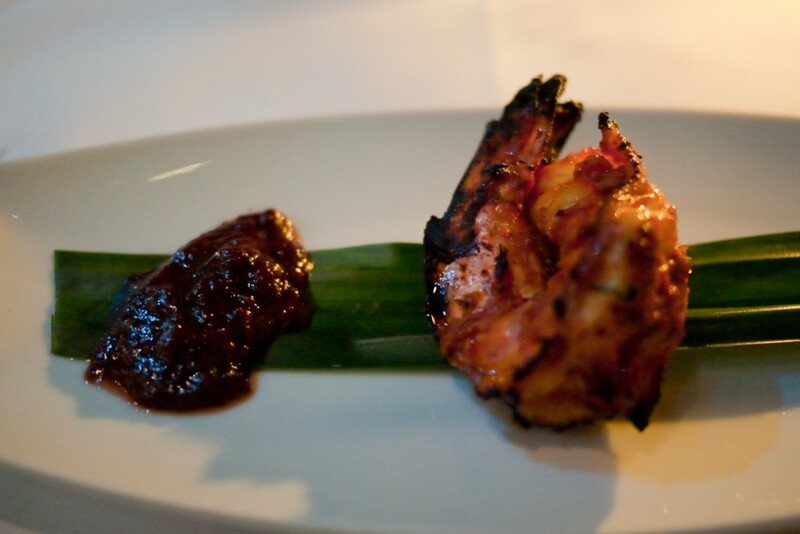 A piece of tandoori prawn was plump, tender and moist. It was accompanied by some strawberry chutney, which tasted more like sweet strawberry jam. The prawn worked better on its own. 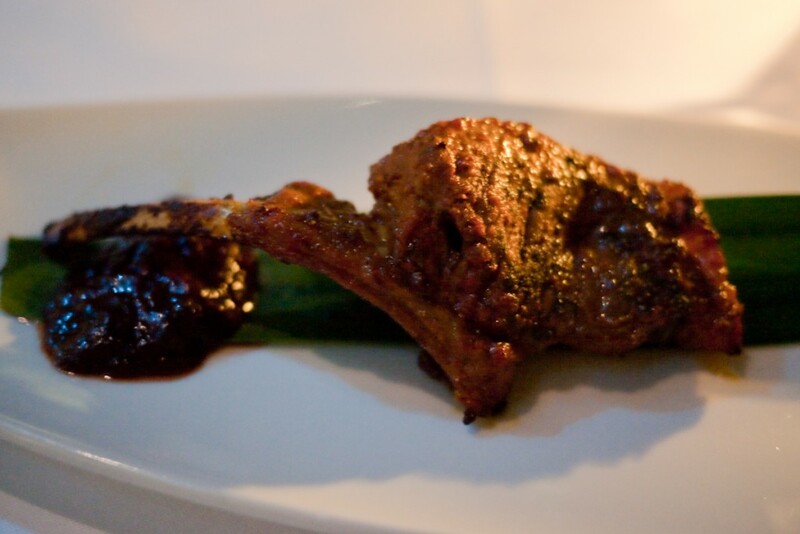 A piece of lamb chop was meltingly tender and flavoursome. A subtle hint of chilli and coriander gave it some character, but a heavier use of these ingredients would have provided the dish with more drama.. The lamb was again served with the ill-fitting strawberry chutney. 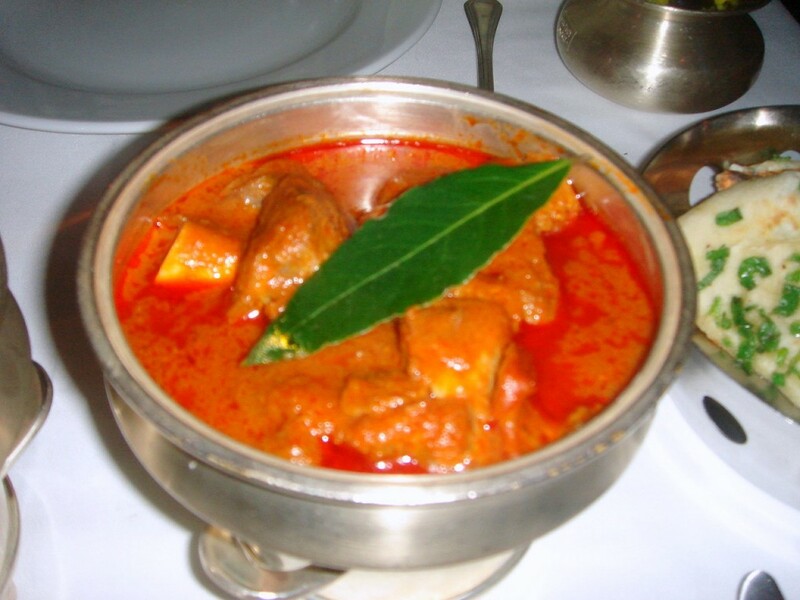 There are three mains to choose from in this menu, and we selected the Goan prawn curry and the lamb handi korma. 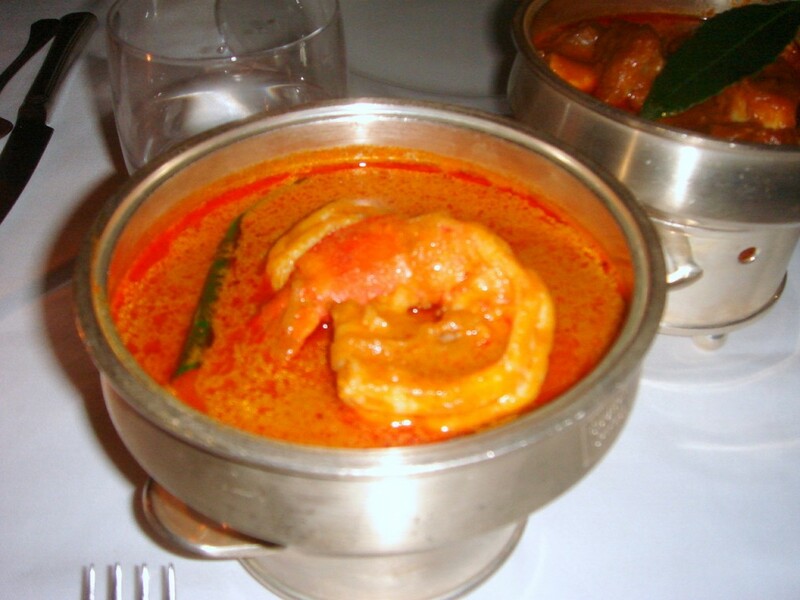 The curry included two jumbo sized pieces of delectable prawns smothered in a tamarind-rich curry sauce. The lamb dish, described on the menu as being similar to ‘osso bucco’, came with meltingly tender meat on the bone, and some mouthwatering marrow. The lamb was tasty, but in comparison to some of the other dishes, it was rather unexciting due to the lightness of its spicing. Mains were served with some warm spring onion naan (kulcha) and pilau rice. However, there were no sides of vegetables which was odd for an Indian restaurant and disappointing as the menu cried out for some greens to balance out the heavy protein nature of it. 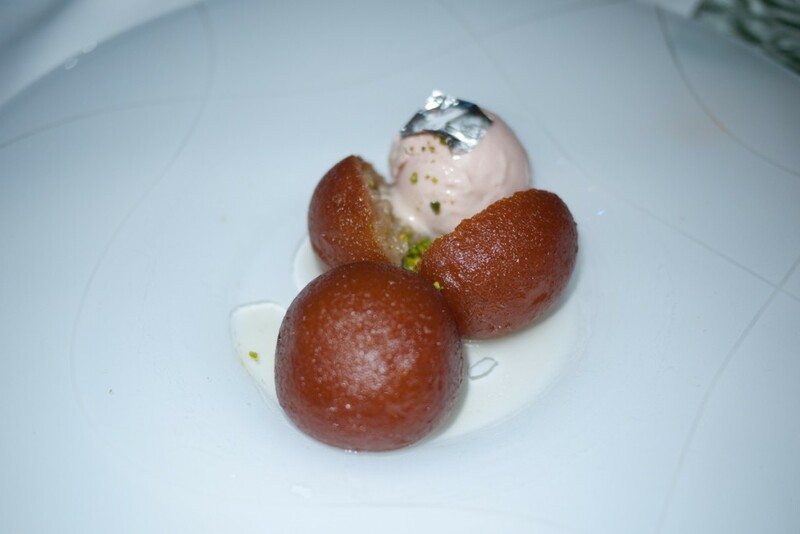 Desserts could be chosen from the a la carte menu, and we selected the gulab jamun (dumplings in sweet syrup) served with buttermilk rhubarb ice cream. The dumplings were resplendent with the perfume of rosewater and the punchy nuttiness of pistachios. 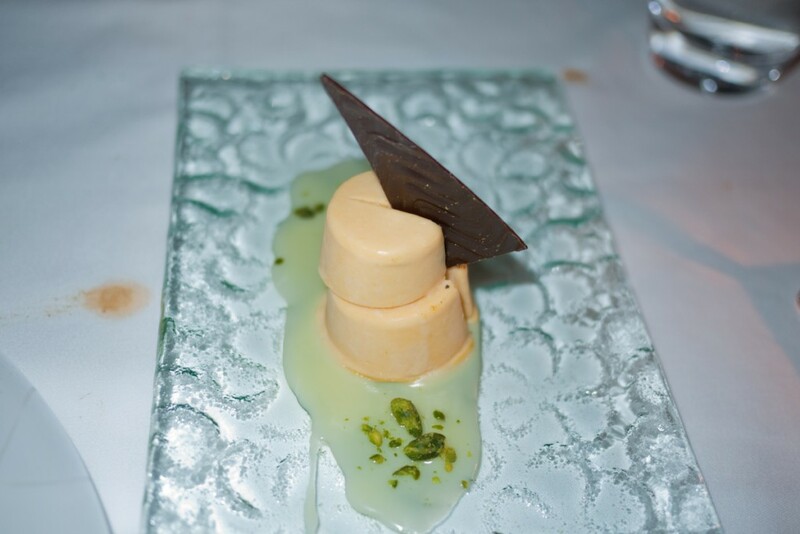 A mango kulfi was equally pleasing, although a few tiny ice crystals had formed in the ice cream. 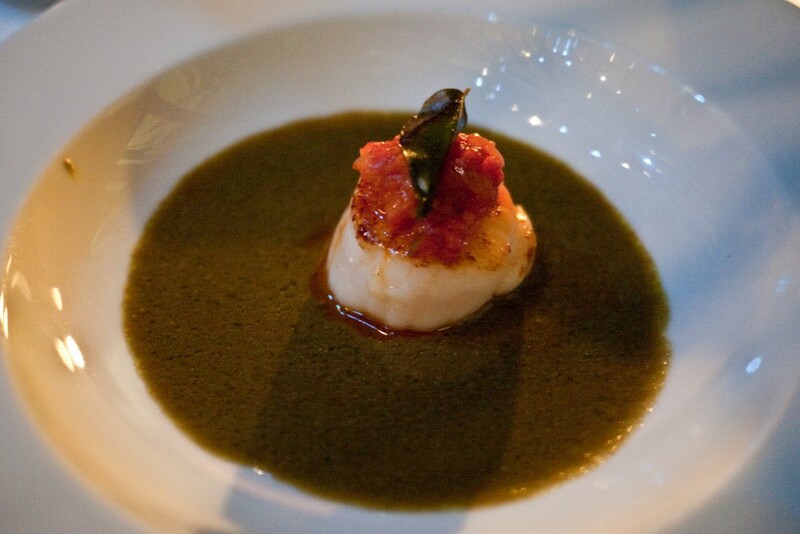 With its intricate and accomplished flavour matching, the highlight dish of this menu was the scallop caldeen. However, as the menu progressed, the dishes seemed to make less use of complex spice combinations, although they were still very tasty. Some might prefer gentler, cleaner flavours, but for me, the essence of Indian food is the spicing. But ultimately, what let this menu down was the lack of vegetable dishes. Starters range in price from £8.50 to £11, and mains from £16.50 to £23.50. Readers would probably do better to avoid the tasting menu, but to choose 3 courses and sides, including vegetable dishes, from the a la carte menu to share instead. This would also come out at about £45 each, and you would also have the benefit of more choice. On its own merits, the food at Chutney Mary was very good. I would have enjoyed having some vegetables in the tasting menu and more intricate spicing in some of the dishes, but overall the restaurant was a reasonable contender in the Indian fine dining stakes. 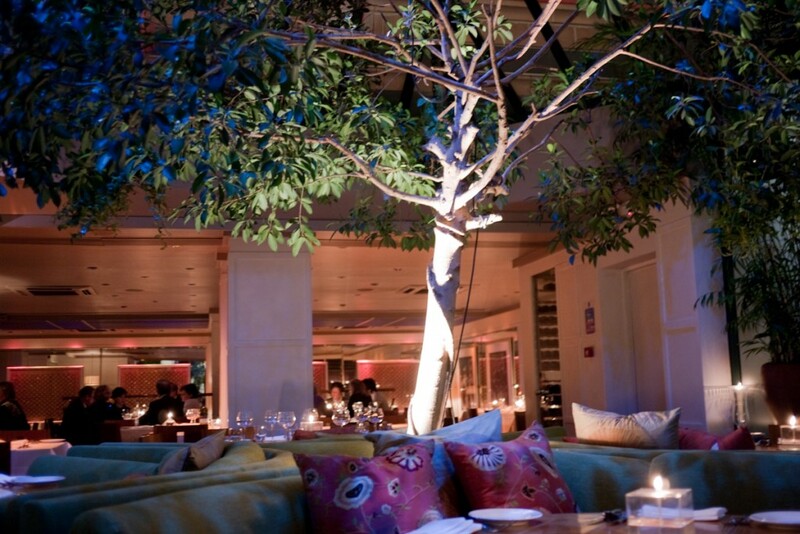 Price range: Tasting menu – £45. Average cost of 3 courses – £45. Excludes drinks and service. Chutney Mary was the first restaurant I visited when I first came to London as a tourist (i.e., ages ago). I haven’t been back since but glad to hear the food is still good. You wrote that it’s unusual to *not* have vegetables on the side at Indian restaurants. What kinds of vegetables do you normally get? I find that whatever vegetarian-friendly dishes I order, they still taste quite heavy and aren’t necessarily vegetables, either. I take your point. But I was coming from the angle of, had I been ordering from the a la carte, I probably would have ordered a veg dish and so I found it unusual that the tasting menu didn’t include one. Hope that clarifies things. Sounds like a very interesting meal. I particularly like the idea of the minced goose kebab. Great idea. And the strawberry jam with the tandoori starters is a bit weird.